Fats can make you healthier, happier, and smarter; also fats can increase your risk for cancer, diabetes, heart disease, and other serious diseases. But how do you know which fats are the right ones and how much to consume, especially when the news seems to change as fast as the latest diet fads? Research is ongoing, but new studies and recent guidelines reveal just how important it is to choose not only the right fats, but also the right quantities. Though the better fats are a necessary part of your diet, they still have the same amount of calories as the bad fats and should also be eaten in moderation. The American Heart Association (AHA) recommends that fats (mostly unsaturated) make up 25 to 35 percent of your daily diet-but only 7 percent of those should be fats on the "bad" list. Bad fats (saturated and trans fats) have that reputation for good reason. They can raise your blood cholesterol level and increase your risk of heart disease and stroke. 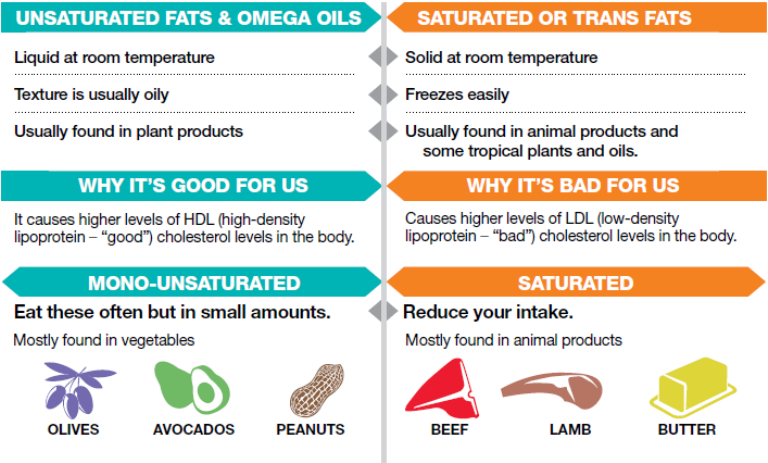 Saturated fats come mostly from animal sources and include meats, cheeses, butter, and some plant oils like coconut and palm oil. Unless your doctor has told you to steer clear of saturated fats altogether, the AHA's recommended 7 percent-if you eat approximately 2,000 calories a day, that's only 140 calories or 16 grams-is a good guide. Consult with your doctor or the AHA's My Fats Translator to calculate the right fat ratio for your body type and level of exercise - this site contains much useful information, however, it does use BMI so be cautious about recommendations based on BMI ...read more. Trans fats rarely occur naturally, are mostly manufactured by food companies to preserve foods and add texture and taste to them, and have no nutritional value. Baked goods, pie crusts, cookies, crackers, margarine, and shortening may contain trans fats; try to avoid them by reading product labels. One of the most popular trans-fat culprits is french fries made in deep fryers at fast-food restaurants. Though many fast-food restaurant chains have eliminated trans fat, and some cities like New York and states like California have or will soon ban them altogether, beware of "trans-free" restaurants. They may still purchase fries and other foods previously fried in trans fat. It's best to be wary of restaurant-fried foods since they pack a lot of calories, no matter what they're fried in. Cutting the fat doesn't necessarily lead to weight loss. Cutting calories and increasing exercise counts more. While reducing the amount of fat you eat contributes to weight loss, some fatty foods that contain protein remain an important part of your diet. And as an added benefit, they may make you feel fuller longer. A recent study of mice and rats that ingested a fatty acid called oleic acid, found commonly in olive oil and other unsaturated fats, showed that once the fat reaches the intestine it can create a feeling of fullness and prolong the need to eat again. The study has not yet been done in humans, but findings may lead to better insight into how healthy fats help regulate body weight. The bottom line is that Fats don't make you Fat. Like anything else we consume, with awareness you can make educated choices on the correct nutrition that will work for you. NB: There is still ongoing research about the danger or value of Saturated fats..
​For more information see the site The Cholesterol Truth.